Like most recent 34's, our boat came equipped with the Raymarine package which included a DSM 300 depth sounder. We seldom use the full fish-finder screen, instead we've set our E-80 displays to show the depth read-out in small windows along the edge of the screens. This works OK as long as the depth sounder is producing a good reading, but we've had a lot of trouble getting our unit to work properly - particualrly in shallow water. Discussions with RayMarine Technical Support revealed that the DSM 300 was actually designed as a "fish-finder" - with a range up to 500-feet - it is not really a shallow-water fathometer. After some fussing, we've finally been able to obtain reasonably reliable readings down to about 5 feet, but that's about it. This spring, we installed a second depth sounder which gives us excellent readings right down to 3 feet. We put the transducer in the starboard hull, so now we actually have readings from each side of the boat. Going down the ICW, this is very cool as we can easily see shoaling as we approach the side of the channel - and of course, this tells us immediately which way to steer for deeper water. In order to make this work, you need a transducer which works on a different frequency from the Raymarine. We purchased a Furuno RD-30 unit which we mounted on the fly bridge to starboard of the E-80 display. (The new unit operates on 235 kHz and so does not interfere with the 200 kHz operation of the Raymarine). We installed a (retractable) transducer in the starboard hull (under the floorboard in the head ) and we now have simultaneous port and starboard depth readings! Another plus is that we also have water temperature AND speed-through-the-water readings. Although not really necessary, it's fun to know immediately what the current is doing. The RD-30 unit costs a mere $359 - plus another $220 for the transducer (an Airmar 235DST-PSE). The biggest job was routing the wire from the head up to the flybridge. PDQ does provide built-in wireways, but it's quite a challenge to snake a wire some 20 feet through them. We are very happy with our latest gadget. Certainly a big catamaran advantage is the ability to have dual depth sounders - it's something I've always wanted! Last edited by Sno' Dog on Tue Dec 15, 2009 12:19 pm, edited 1 time in total. Good idea! Have thought about doing the same thing but was not particularly interested in spending what RayMarine wants for their unit. 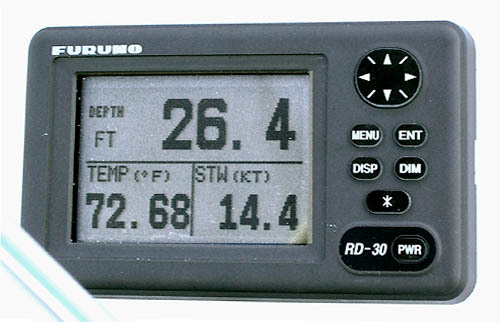 We have a depth only transducer in the port hull and like you, we have the data displayed on the nav display. The problem that got me thinking about a 2nd unit was an incident in a dredged channel. We were meeting another boat and had moved over toward the edge of the channel. I was looking at the depth and it was showing 18' - under the port hull - when we hit something very hard and took about 2" off the bottom of the starboard skeg! Fortunately we didn't damage the prop or rudder. Hadn't thought about the interference between units but it only makes sense. Thanks for the post!! Henry, I did a similar mod last season. I also have a Raymarine DSM 300 but asdded a stand alone Raymarine Depth Sounder for the Starboard Hull. Also installed the transducer under the head sole with the reader on the flybridge. It is nice to have redundancy and be able to get a read on which side of the boat is getting skinny. For cats I think this option should be almost required for our boats.